Preparations by the Sri Lanka Government to set-up the first naval base in Batticaloa district close to Eravur was revealed in a meeting between the Police officers of the Batticaloa district, a Muslim Minister and Muslim representatives in Eravur. The special meeting which took place at Eravur Ummah Mosque Friday noon also discussed special security arrangements for Muslims in Eravur. 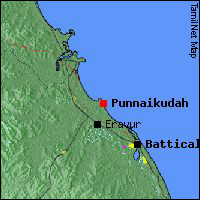 Punnaikudah beach 4 km northeast of Saddam Hussain Village was identified as the location for the first Sri Lankan naval base in Batticaloa district, Muslim attendees to the meeting told TamilNet. Batticaloa Superintendent of Police (SP) D.B. Ranasinghe and Eravur Senior Superintendent (SSB) M.S. Kiragala with a Muslim Non Cabinet Minister of Disaster Relief Services, Mr. Ameer Ali Shihabdeen, met Muslim representatives in Eravur and the board members of mosque societies. Sri Lankan police officials said they would have a police post at each of the thirteen Mosques in Eravur, Muslim sources added. Night-patrols by Sri Lanka Army and Police would be provided as an additional security measure in and around the Muslim villages, the sources quoted police officials as saying. The annonuncement of the plan to set up a naval base together with the protective security measures to Muslims in the area, was timed to preempt protests from Muslim villages, sources added.